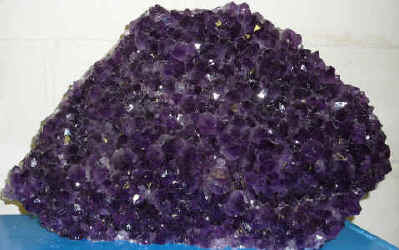 This page tells you a little about "Inner Light Crystals" latest purchases of crystals and minerals. Why not visit our on-line shop to find out more - or give us a call to arrange to see them with us here in Llechryd, Ceredigion in south west Wales! Blue Obsidian - natural nuggets; Emerald, Green, Blue and Indigo Kyanite - blades (polished and natural) and clusters; Ananda Quartz (Anandalite) - clusters; A grade Herkimer Diamonds; Seriphos Green Quartz - crystals; Aegirine - blades; Euclase - crystal; Azurite - crystal; Amber - pieces; Blue John Fluorite - crystal clusters, and polished pieces; Scolecite - fans; Zeolite clusters - including Stilbite, Heulandite and Apophyllite; Watermelon Tourmaline crystal pieces; Indicolite (Blue) Quartz - roughs; Silicon - raw chunks; Scottish Greenstone - polished slices; Seraphinite - polished slices; Included Quartz (Hedenbergite) - crystals; Malachite - polished shape, Lapis Lazuli - polished freeform; Thunder Egg (Amulet Stone) - polished nodules; Phenacite - crystals; Zircon - crystals; Moldavite - AAA grade specimens; and AAA grade Amethyst - large / medium standing clusters. Rose Aura Quartz (a new and very pretty treated quartz); Sodalite with Hematite (an unusual mix of blue and ornage); Crysanthemum Stone (we have only had this as palmstones before); AA grade Banded Fluorite (fabulous colours and clarity); AAA grade Blue lace Agate (a lovely deep blue with a great polish); Vivianite (we have only found this as larger polished slices before) and Banded (pink) Mangano Calcite (a new find). Pink and White Girasol - palmstones and pebbles; Banded Agate (Shantilite) - pebbles and cabochons; Rose Quartz - shapes and spheres; Labradorite - shapes and freeforms; Indigo Gabbro (Mystic Merlinite) - pebbles; Quartz: Clear, Fire, Smoky, Phantom, Rutilated, Tourmalinated, Skeletal, Enhydro and Included - polished shapes, pebbles and points; Carnelian - pebbles; Natural Citrine polished points; Copal - wands (some with insects); and Amethyst - polished shapes.